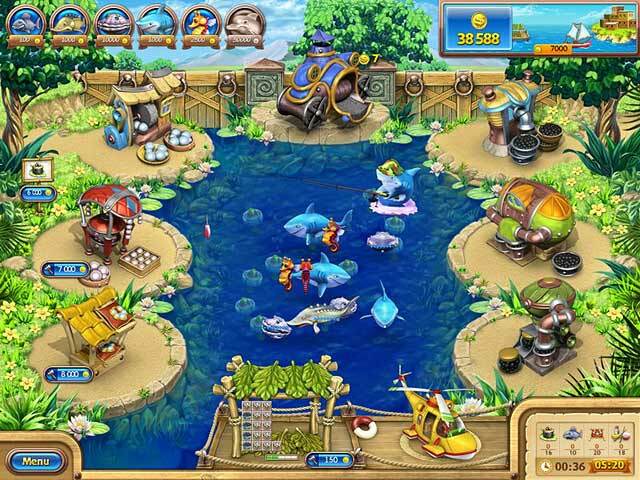 Farm Frenzy: Gone Fishing is rated 3.7 out of 5 by 10. Rated 5 out of 5 by RITNAT from nice to play it I play the game for I hour and I think i'mgona buy it. its a relaxing game. Rated 5 out of 5 by klindsey6 from WONDERFUL & CHALLENGING!! I bought this game over a month ago and have been completely hooked on it ever since! I FINALLY got all gold levels just the other day ... and am now starting all over, it was just so challenging to me! I highly recommend this game to any Time Mgmt lover!!! Rated 4 out of 5 by s_kane24 from Good Good, but like aztec tribe. Only not as good. 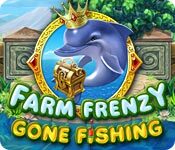 Rated 4 out of 5 by frini7 from A fun game A fun and interesting game.Quite challenging.Would definetely recommend this game to farm frenzy lovers and anyone who likes a good time management game. Rated 4 out of 5 by FZhang from Farm Frenzy Part X When Farm Frenzy first launched, I played a trial version and got really bored and hated it. I thought the visual graphics were sub-standard at the time even for a casual game. I gave Farm Frenzy a try again when American Pie was just released. The visuals were much better and I patiently went through the first 3 levels (extremely boring...). After which I was totally hooked on Farm Frenzy series. I finished American Pie and went on to other FF games. I decided to get Go Fishing (havent played GF and Ancient Rome, Viking) this time cause the visual looked a little different from the normal farm land setting. The game play is pretty much a repeat of every other FF game. 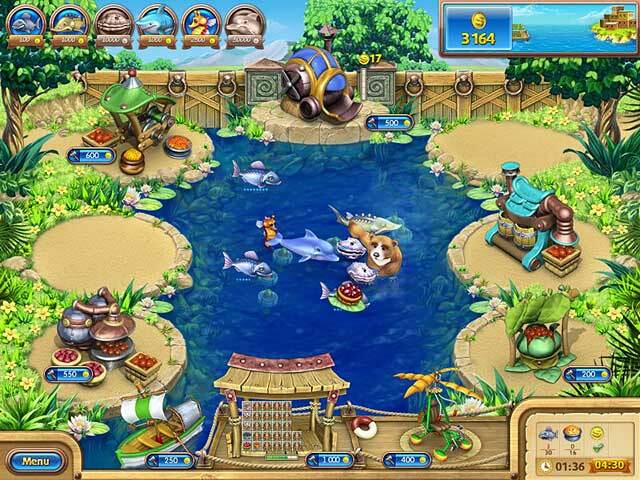 The most notable difference is the game utilizes sea animals instead of land animals. Instead of Hay, you have the fish food to throw into the water. One thing to note here is that hay was hard to stack up without you losing some of it. With the fish food it was easier to throw them toward the bottom of the screen thereby avoiding the fish getting captured/thrown out. It makes getting the Gold star a lot easier. Rated 3 out of 5 by evil_pixieangel from Challenging.... I love the farm frenzy games and this one is fun too. However it is so very difficult. Be prepared to do levels over and over again until you get gold if you can. I like this game, but way to difficult in my opinion. On that note it is a good game to take up time if you are bored. Rated 1 out of 5 by journeys_ from Huge disappointment compared to other Farm Frenzy games Too slow, too boring. Glad I didn't buy it. 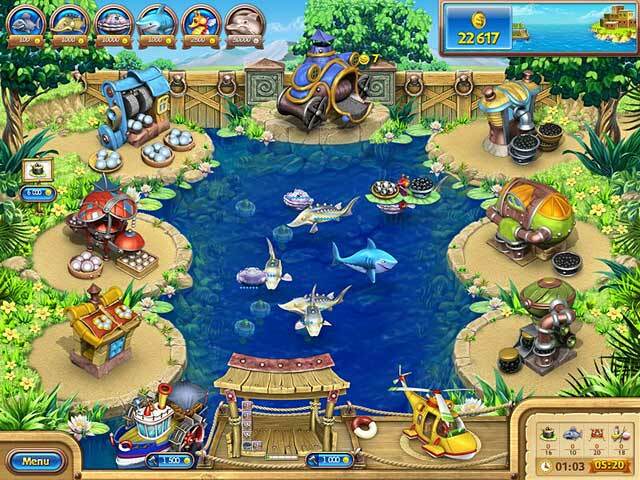 Rated 1 out of 5 by atrayu1 from Don't waste your money Game is way too cheap..the fish don't lay eggs fast enough nor does any of the other animals..you will just end up in a bad mood from this game..